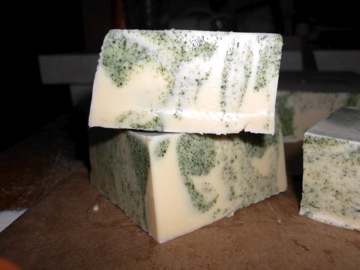 This is my newest creation, Tea Tree Bastille Facial Soap (though you can totally use this on your body too!). What is Bastille soap? 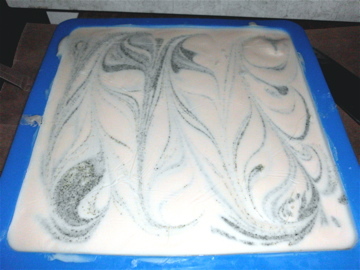 It is soap where the main ingredient is Olive Oil but also contains other oils as well. Mine has Olive Oil and Castor Oil. Castile Soap is Olive Oil only though many companies out there don’t follow this rule (ahem Dr. Bronner). Anyways what’s in my soap that makes it great for the face (and body too!)? Olive Oil: This creates a mild soap great for sensitive skin. It’s highly conditioning and is said to also help with dry skin, minimizing scars, helps eczema and psoriasis, and rashes and it helps the skin hold in the moisture. Castor Oil: Helps add lather to the soap while still adding conditioning properties. Calendula: has anti-inflammatory qualities that can prevent infection in minor skin wounds when applied topically. It can reduce itching, redness, pain, and swelling of insect bites and rashes. It is soothing for sunburns, cuts, scrapes, dry and chapped hands, and minor burns. Spirulina Powder: is a type of blue-green algae that is rich in protein, vitamins, minerals, and carotenoids (a type of antioxidant that can help protect cells from damage). It contains nutrients, including B complex vitamins, beta-carotene, vitamin E, manganese, zinc, copper, iron, selenium, and gamma linolenic acid (an essential fatty acid). Tea Tree Essential Oil: Has healing properties as well as being an antifungal, anti-inflammatory, antimicrobial and antiseptic. It’s now cut and currently on the drying rack to sit for a few months. It will then be a gentile moisturizing facial soap. Can’t wait! I love your new batch!!! I have to give it a try!! Could you kindly share the amount of each ingredients? And if I am not find the coconut milk what should I do? I am kind of new in CP process soaps, I usually do Melt and pour soaps. Thanks for sharing your posts, they are great!!! PS: if you would like to visit me spot here is the link: mardjabones.blogspot.com, all coments are welcome. I would recommend that you try a simple CP soap recipe 1st then graduate to this one as it uses many techniques. 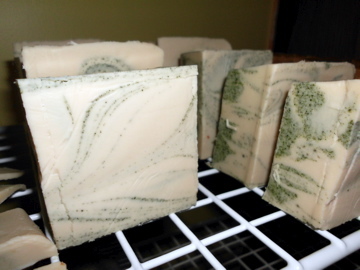 One of the easiest ones is making naked bastille soap which is 95% olive oil and 5% castor. I would make a small batch and run it through a lye calculator. I also recommend having a stick blender as this one will take awhile to get to trace. Soapqueen tv has a great series about making CP soap. Good luck! Thanks a lot for your advises and recipe!!! Today I got all the oils so I’ll keep you posted how it goes with the naked bastille soap. How exciting! I can’t wait to hear how it turns out for you! For bastille soap make sure you let it cure for a good 4-6 months before use. Also it may need to sit in your mold for a few days before it is hard enough to cut unless you do a water discount. Good luck!